Anyone recognize this?I'd love to know where this cover photo was taken. Can anyone ID this Dell Arte?This is one of their older guitars, I believe it was built in the San Diego shop. I'm interested in knowing what model it is. Anyone know this Bolero (not troublant)Heard this walking through an airport, my band does it now, but I dont know the name of the song or even the artist. Anyone know this one? Anyone recognize this trumpet player? Trumpet player, most likely Jazz, from Paris circa 1934 or later. Anyone recognize this player? Person probably stood 5'6" - the Donald Duck suit he is wearing as well as the hat is at the Museum of Whimsy in Astoria OR. Am helping them try to ID the player. My sources say Harry James. 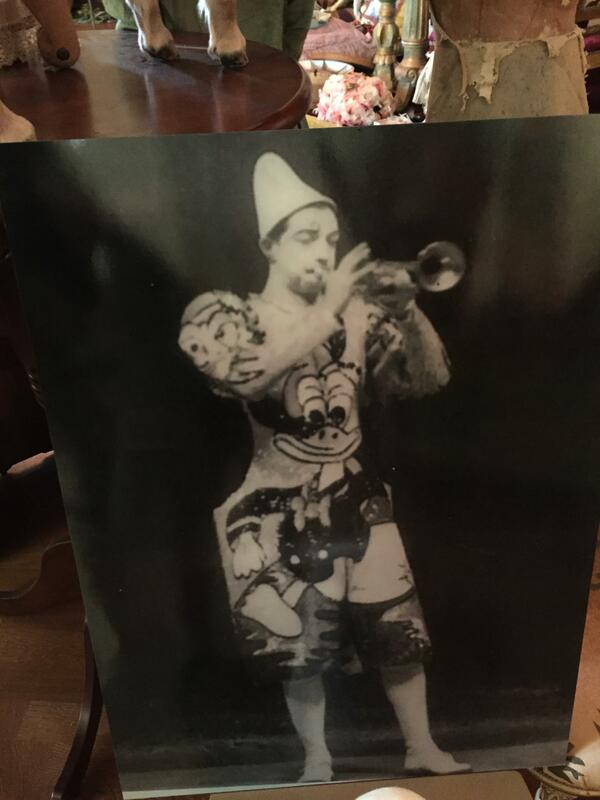 The outfit suggests circus performer, and James’ father was a circus bandleader. That looks like a good possibility Bopster. Thanks!!! What are your sources? I've contacted a Harry James site and sent them this inquiry. Will report any response. My “sources” are several friends who were fans of Harry James during his heyday. Thanks much Bopster! We also looked at that photo some more. It looked somewhat posed and cold have been anyone holding a trumpet. But with some image enhancement we could see the band playing behind him - all in various circus style attire. I'd say Harry James with 99% certainty. To confirm, I found the LinkedIn contact for his son, who is or was a real estate developer in the Dallas/Ft. Worth area and have sent him a message.